How to manage the risk from technology obsolescence with a combination of LeanIX and the BDNA Technopedia standard technology catalog. Most companies are much better at introducing new technologies than retiring them. The cost of running unsupported technology can be high. Costs of IT outages and data breaches run into the millions. At the end-of-life of technology, IT management has to deal with challenges such as integration issues, limited functionality, low service levels, lack of available skills and missing support from vendors. The twenty largest technology vendors alone provide over a million different technology products. The related information, like lifecycles, can change every single day. BDNA’s Technopedia provides a standard catalog with the latest technology product information. This information can be fed automatically into LeanIX and serve as the basis for a proactive management of risk from technologyobsolescence. 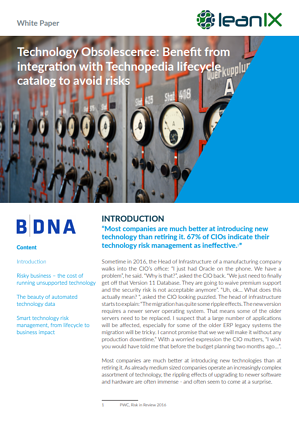 This whitepaper provides practical advice on how to manage the risk from technology obsolescence with a combination of LeanIX and the BDNA Technopedia standard technology catalog.